The big question in this project has always been how to get figure reference so that the two divers flow as if suspended in water and give some indication that they are negotiating a gentle tide while working to attach the explosives to the lower half of the mine. Given that the chances of a model holding such positions long enough to work from are slim, I decided to catch the movement by way of 3D scans and then use the results as my reference. 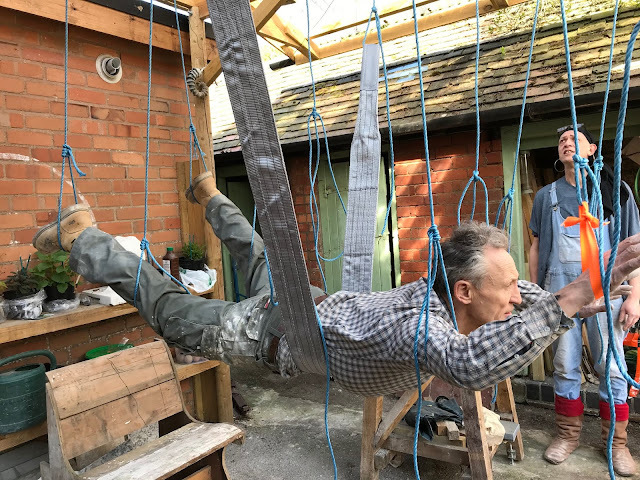 To do this, Misti constructed a sling system with slip and grip knots so that limbs could be manoeuvred to correspond to the maquette positions. I am fortunate to have a gym nearby which is run by the remarkable Andy Hackney. Andy kindly agreed to model in what turned out to be a strenuous position. To get a scan, Ian from Europac3D needed Andy to stay still for 5 minutes at least. No mean feat. Here are the pictures. 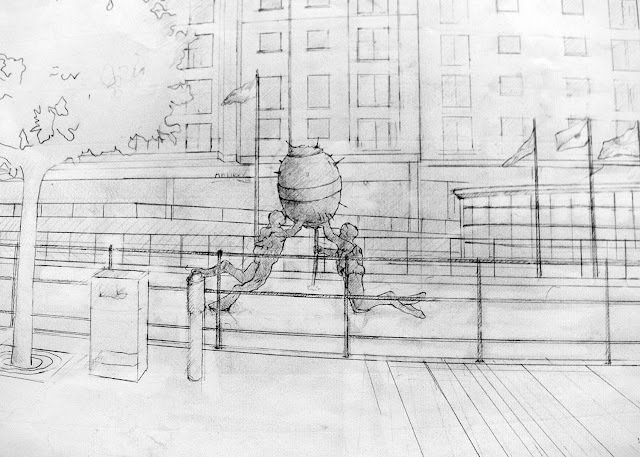 The sculpture will be made, initially, at half-life size. This is so that the composition, movement and details can be read in the studio as if one were looking at the finished work from afar. Also, at this scale, it is a lot easier to make changes as the work develops. The first stage, before scaling too half-life size, is to work out what the dimensions are in reality. 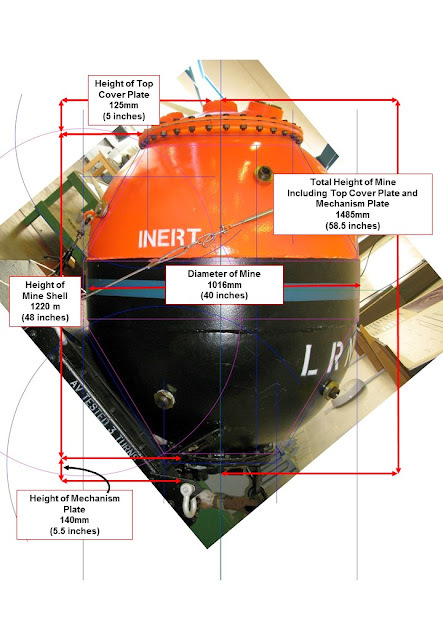 We do this by taking the basic dimensions of the Mk XV11 mine, that I took on my visit to HMS Collingwood, and superimposing them onto photos. From this, and with George's kind help, the finer details can be worked out. 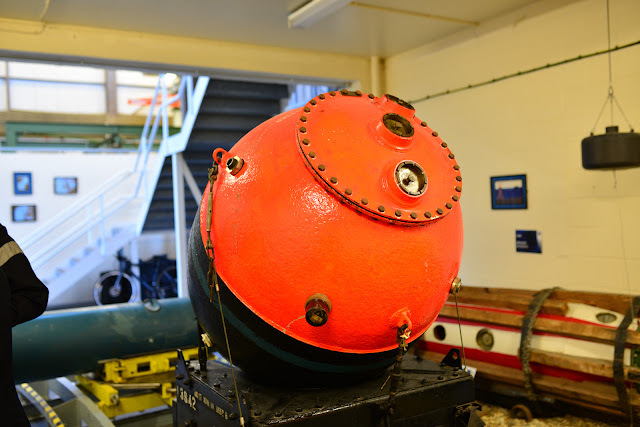 David Sandiford organised a series of meetings and visits to potential sites for the monument by way of introducing me to the field of mine disposal and safe rendering of live ordnance. In a nutshell, we, the general public, have little or no idea of what these teams of calm, sensitive service men and women do on our behalf. To give you an idea, the team I met at the Defence Diving School, Horsea Island are called out to attend to an actual or suspect bomb approximately every 18 hours....and that is just one team....and that means that, despite the high level of training, skill and equipment, their lives are at very real risk once a day; and people are killed in the course of this work. At risk of sounding pompous I felt, at the end of this day, a desire to say a big thank you to these men and women, on behalf of us all.